I have no knitting pics today. I have started on the STR Mudslide and Stonewash socks. I’m pretty happy with how they look. I’m about 3″ into the toes. I’ll try to have a pic tomorrow. Today, I offer this unfortunately blurry glimpse of a visitor to my butterfly bush. He was very shy. Every time I tried to snap a picture, he moved to the other side of the flower spray. 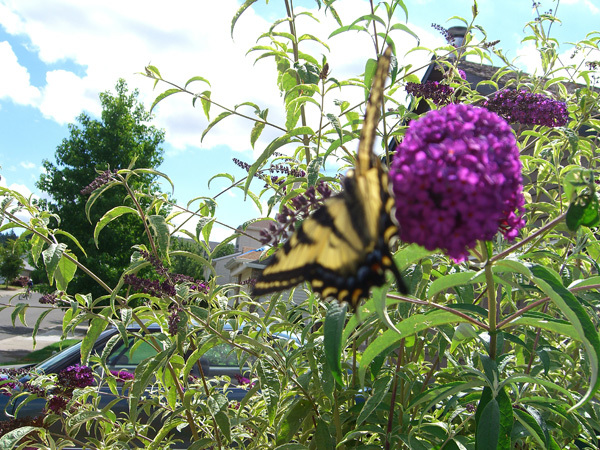 So this picture was taken “on the run.” I hoped he would come back, but since then the only visitors have been the bumbles, who love the butterfly bush and the lavender that grows around it.